Edinburgh Military Tattoo: what a spectacle! In the month of August every year Edinburgh, Scotland’s capital city, resounds to the sound of the pipes and drums of massed pipe bands as they come together for three weeks as part of the Edinburgh Festival (a term for the many cultural and performance events held in Edinburgh during august). The Royal Edinburgh Military Tattoo is an annual event which features the British armed forces as well as Commonwealth and international military bands and both military and civilian participants ranging from motorcycle display teams to marching drill display teams as well as highland dancers and, of course, pipe bands, solo pipers and much, much more. 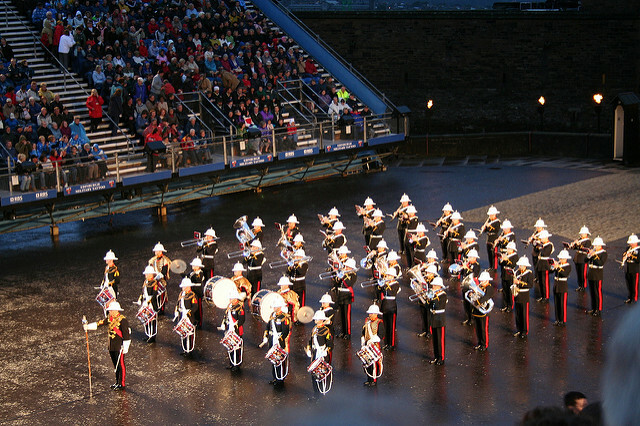 Taking place on the esplanade of Edinburgh Castle the tattoo attracts well over 200,000 visitors each year – including about 70,000 from overseas – with millions more seeing the event on television worldwide. The spectacular performance is held every weekday evening and twice on Saturdays throughout august and its proud boast is that it has never been cancelled due to bad weather and it has proved so popular that tickets for the tattoo have been sold out for 18 consecutive years. Each tattoo is led by one of the four British armed services – alternating between the Royal Navy, the Royal Marines, the Royal Air Force and the army. 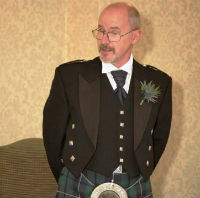 Each year also has a particular theme in celebration of an organisation or event and the largest ever gathering of massed pipes and drums was for the 50th anniversary tattoo in 2000 when there were 15 bands on parade, including seven of the eight Scottish regiments then in existence. Since it was first held in 1950 48 countries from all corners of the world have sent representatives to the tattoo and in 2010 it became the ‘Royal Edinburgh Military Tattoo’ when Her Majesty Queen Elizabeth II awarded the Royal title in celebration of its 60 years of almost faultless performance. The current patron of the tattoo is Her Royal Highness The Princess Anne. 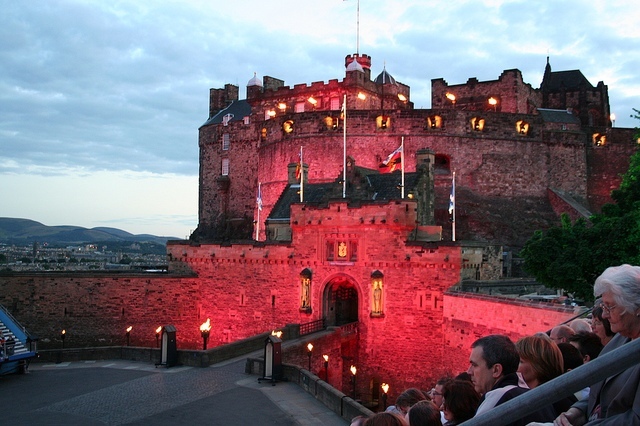 What many people don’t know about the Royal Edinburgh Military Tattoo is that it is run as a charitable event and over the years has given some £8 million to various charities and organisations both military and civilian. It is also estimated to generate around £77 million in revenue for Scotland’s economy each year. 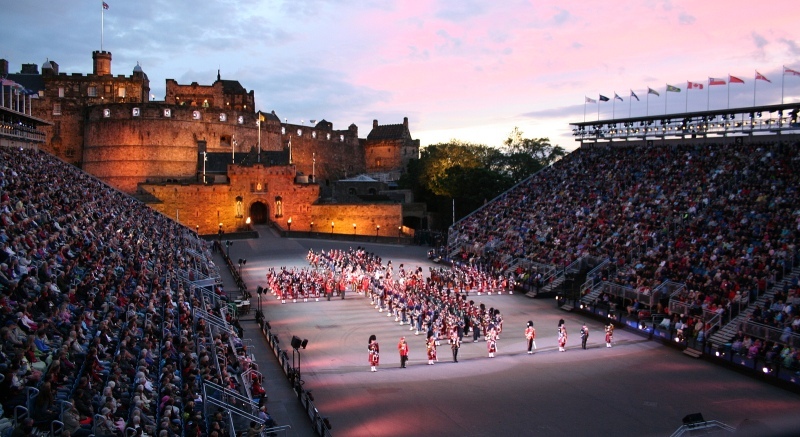 So what can you expect to be enthralled by at the Royal Edinburgh Military Tattoo? The music at the tattoo covers just about the full range of music imaginable from bagpipes to classical to pop, from jazz to folk to country and western and over its nearly 70 years the tattoo has seen a diverse mixture of performers both military and civilian from many countries – dancers, steel bands, drill teams, camels, elephants, police dogs, cavalry and even zulu warriors! 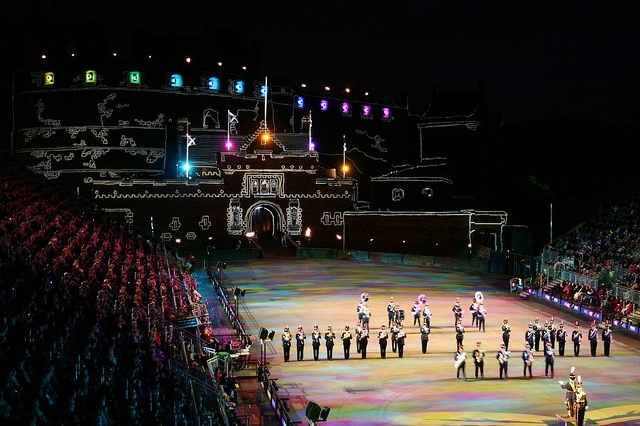 The result has been called ‘The Greatest Show on Earth’ – a magnificent spectacle of music, entertainment and ceremony set against the historic backdrop of Edinburgh Castle – an unforgettable experience which is known and admired worldwide. Isn’t it time you came and saw for yourself?